I grabbed a flight to Oakland. David, my partner from Story Games Glendale, was supposed to fly into San Francisco the same morning, but due to fires in northern California, they closed some runways... and hence he ended up on my flight! We land, connect up, and head to a few spots. First stop: Berkeley. I haven't been there in years. I had lots of friends who went to school there, and lived in the bay area and San Francisco specifically for many years over a decade ago, so it was nice to just be in that space. I've never been to a Half Price Books, but apparently it's a thing. A used bookstore of sorts, and they even have an RPG section! What? It was seriously a large section, and across from the RPGs was a full shelf of board games. 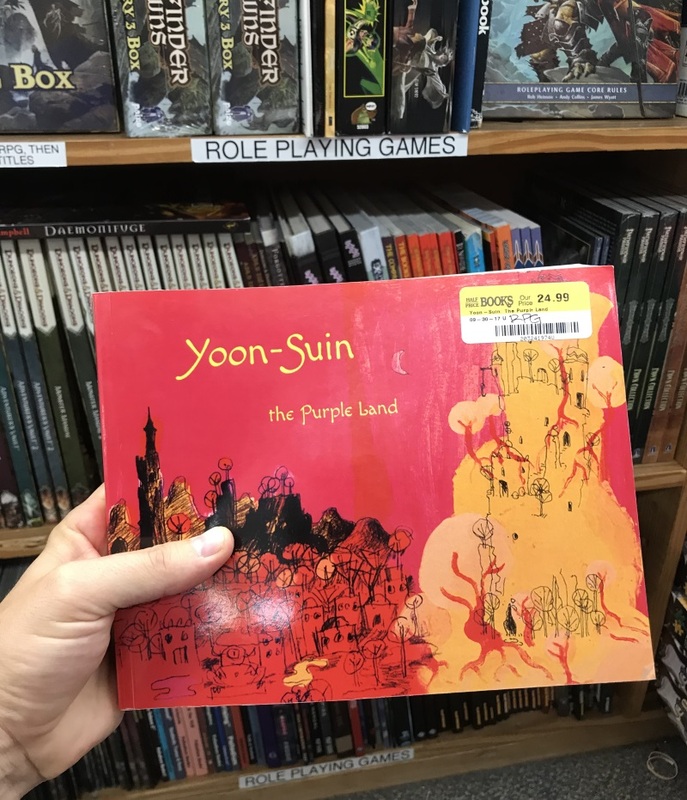 I purchased more than a few items (including Booty and Beast with Erol Otus art from 1979), even finding a copy of Yoon Suin (a world setting that I'm currently in a mini-campaign of with some fine folks from The Gauntlet online community). A nice start to the adventure. Not thrift store cheap, but I'll take it! My original plan was to head to Walnut Creek and the hotel to meet my friend Jerry, coming down from Oregan, but alas... those runway closures at SFO were causing havoc. His flight was delayed over 3 hours. So instead I suggest that David and I head to Oakland and Endgame specifically. This excellent game store is a sponsor for Big Bad Con, and brings a lot of the merchandise for the (admittedly very small) "dealer hall" of the convention. The shop itself is excellent. The indie press RPG section has a great selection of material, and the used area is full of little treasures. It was a bonus that we were there just prior to the convention, because there was a whole bunch of boxes chock full of games they were bringing to Big Bad. In other words, we would get first pick of all the goods! I picked up The Shab Al-Hiri Roach by Jason Morningstar (used for $5! ), First Ride Last Ride (a new solo game by the same), and a hard copy of Scenic Dunnsmouth. Jerry had landed, and headed over to Endgame, and the three of us grabbed sausages next door. David went to go meet his brother. Jerry and I settled down to chat, and ended up playing a game of Battle Line (one of two board games I brought for the weekend). Eventually we headed out to Walnut Creek and the hotel. We took the BART to Walnut Creek and walked to the hotel. Grabbed our room, excitement brimming. Immediately started running into all sorts of friends, Andy and Kristine from Seattle who I'd just seen a few weeks prior at GeekGirlCon, and many others. Hugs all over. Eventually, we just ended up doing a lot of that socializing that ends up happening when you get this many lovely nerds all in one space. "games games games". Eventually there was a little more earnest in trying to have a game get going. Well... Alex Carlson had a solo game they were working on which involved being a person with a all encompassing collection that may eventually drive you mad. And they were wondering if it could be played in a multi-player mode instead of solo. And hence... playtest. We adjourned down to lower floor (as we had done in a prior year) to grab a table and start gaming. The crew included Alex as GM, Andy and Kristine, Jerry, . I can't remember all the details, but the game had a simple premise which involved building your collection (in this case we went with Pellet Pals - Beanie Babies with serial number filed), and a sanity-type mechanic which could swing from one side to another on a single axis. If you got to either end of the line, the game ended in one of two (both tragic?) ways. There was a sort of hex "map" in the center of the table which included a mechanic which led you into story cues of various types to help drive the type of item added to the collection. Instead of playing solo, we each took turns playing the scene, as the same character (a girl collecting these Pellet Pals, if I'm remembering correctly). It was a fascinating little game, and we all agreed there are some little tweaks that could tune it up, but it was definitely something we'd play, and had a really good time with! We agreed a multi-user variant for this solo game is a must. Love seeing a game in raw form!